Special Discount on 2017 Corvette Orders - Good for May Only! - MacMulkin Corvette - 2nd Largest Corvette Dealer in the World! Home >> Dealership News >> Special Discount on 2017 Corvette Orders – Good for May Only! Special Discount on 2017 Corvette Orders - Good for May Only! With the release of official pricing on options and packages from Chevrolet for the 2017 Corvette Stingray coupe, convertible, Z51 and Grand Sport, MacMulkin Corvette is now taking orders for 2017 Corvettes. We are offering a special discount on all 2017 Corvette orders (does not apply to the Grand Sport Collector Edition) for the month of May only! You must get your deposit in before the end of the month so don’t wait! Call our Corvette Team at 603-888-1121 and get your order in today! Note: Supplier Discount is available if it exists at the time of delivery and you qualify. Excluding the Collector Edition. 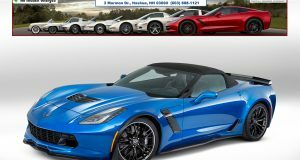 Previous: MacMulkin Corvette is Now Accepting Orders for 2017 Corvettes!